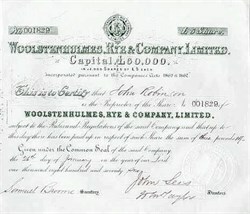 Beautiful Stock Certificate from the Woolstenhulmes Rye and Company issued in the 1876 for shares of capital stock. This certificate has old sytle printing and is over 129 years old. It is signed by the Directors of the Company and has an embossed corporate seal which has an old building in it. The actual certificate is much nicer than the scanned picture indicates.